“The View” co-host Whoopi Goldberg said on Tuesday that she won’t let ABC executives make her final weeks with departing co-hosts Nicolle Wallace and Perez a sad affair. The changes to which Goldberg referred, which include a shift to less serious discussion topics, are already becoming apparent. Later in the episode, during a discussion about recent comments made by Mike Huckabee about the Iran nuclear deal was cut off abruptly (see video above). “I think that what he says is his truth … he shouldn’t apologize for what he feels,” she said. But before the conversation could continue, a bell sounded and comedian Mario Cantone appeared onstage carrying a tray of cheesecake, derailing the segment and awarding audience members with a $100 gift card to The Cheesecake Factory. The 2015 nominees were announced Thursday, July 16. The 67th Annual Emmy Awards will be broadcast live on Fox on September 20 at 8 p.m. ET/ 5 p.m. PT. 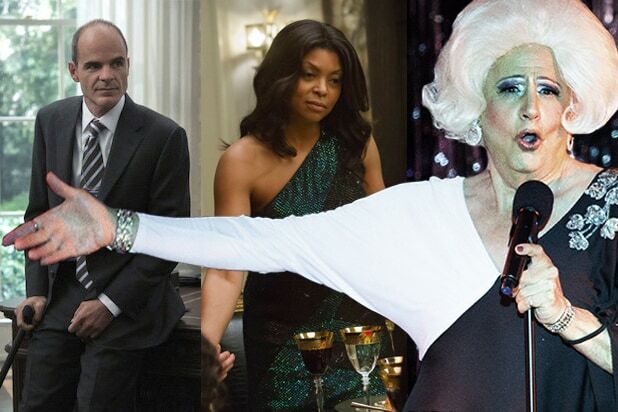 Michael Kelly, "House of Cards"; Taraji P. Henson, "Empire"; Jeffrey Tambor, "Transparent"